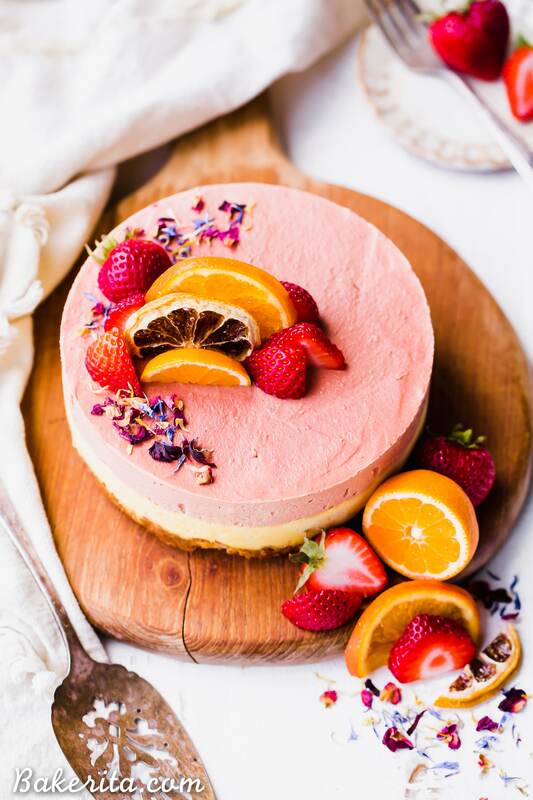 This Strawberry Orange Cheesecake with Coconut Crust is not just beautiful, but it’s bright in flavor and absolutely delicious! The lemony coconut macaroon crust is perfect with the strawberry and orange flavors. You’re going to adore this gluten-free, paleo and vegan cheesecake. If you’re reading this the day that’s it’s posted…then I’m on my way to ALASKA!!! My entire mom’s side of the family (minus my sister – miss you Shay!) is heading out on an Alaskan cruise for the next 8 days and I  can  not  be  more  excited. It’s going to be a bit of a struggle (I think) to keep up the healthy eating on the cruise, but imma do my best and then I’m going to come back and tell you allll about how it goes to try to stay plant-based + GF on a cruise. Look for a post about it coming when I’m back! But for now – let’s talk cheesecake. 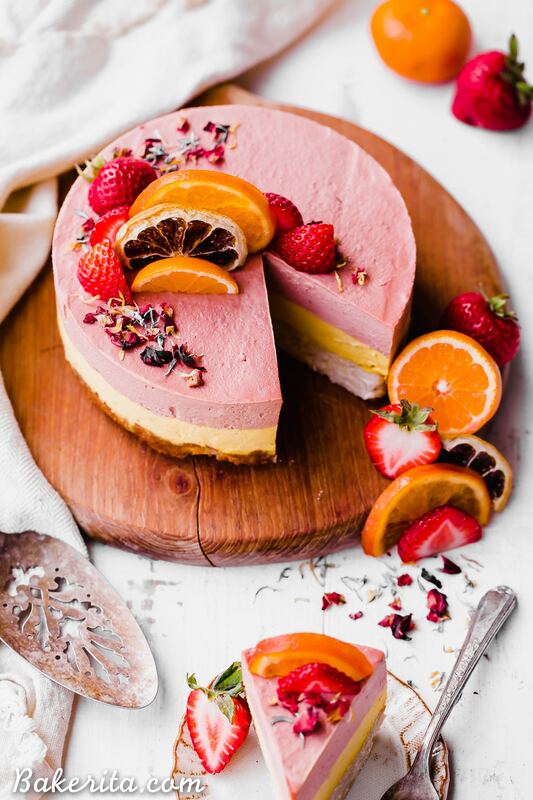 More specifically, strawberry orange cheesecake with coconut crust. OMG. You guys. I wish I could give each and every one of you a slice of this goodness! When I took my first bite, it reminded me of my favorite strawberry, banana + orange juice smoothie from when I was a kit (minus the banana flavor). It’s smooth, creamy, tangy, and absolutely scrumptious. The orange and strawberry flavors are so bright! And the coconut crust! The coconut crust is essentially a giant coconut macaroon – it’s chewy and rich and wonderful. I added some lemon juice and zest to the crust too, to add an extra layer of tangy deliciousness to the cheesecake. It provides the perfect chewy/crunchy base to the creamy layers piled on top of it. The first layer is orange flavored, with a hearty dose of fresh orange juice + zest, along with some softened goji berries. The goji berries add a beautiful orange color but the flavor doesn’t come through, which is what we’re after. On top of the orange layer, we’ve got a layer of strawberry goodness. 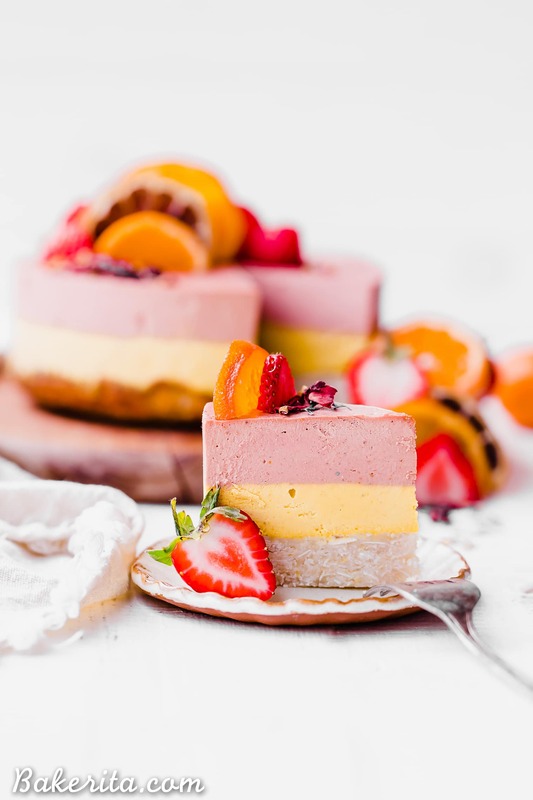 No need to make two entirely separate layers though – the strawberries (both fresh and freeze-dried) are added to part of the orange filling to make a strawberry-forward layer, that still has some of that orange tanginess coming through. 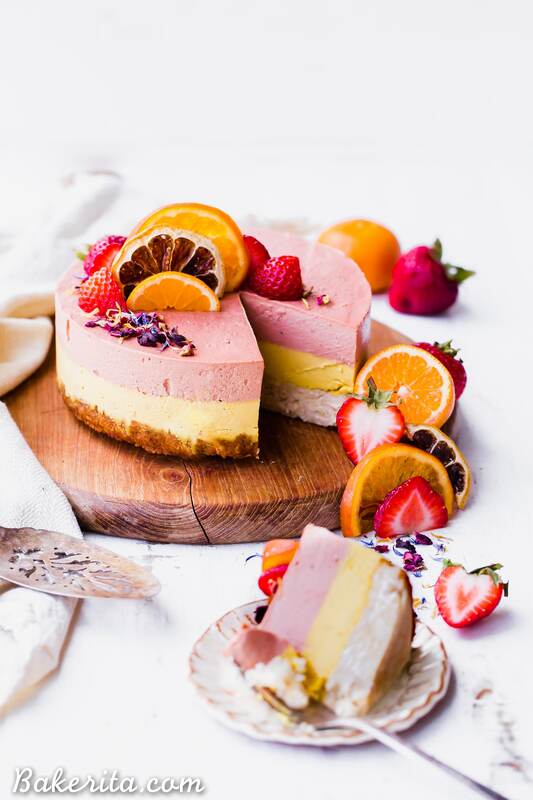 It’s garnished with all sorts of goodness – fresh strawberries, sweetened orange slices, dried flowers, even some dried lemon slices! I was going for a dreamy sort of sunset look – how’d I do?! If you’re into strawberries, oranges, or coconut…I think you’re going to go nuts for this one. It’s so vibrant and bright in flavor that it’s pretty hard to resist. Hope you’ll give it a try to cool you down one day this summer, or to bring some brightness to your winter days :) enjoy, my loves! 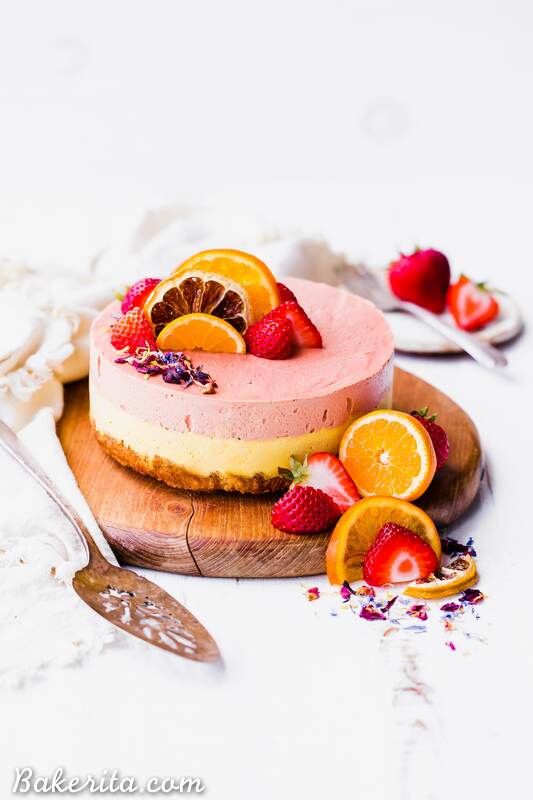 This Strawberry Orange Cheesecake with Coconut Crust is not just beautiful, but it's bright in flavor and absolutely delicious! The lemony coconut macaroon crust is perfect with the strawberry and orange flavors. You're going to adore this gluten-free, paleo and vegan cheesecake. Preheat the oven to 300°F. Grease a 6” springform pan with coconut oil, or line an 6” cake pan with strips of parchment paper for easy removal, and grease well with coconut oil. Set aside. In a large bowl, stir together the almond flour, shredded coconut, salt, maple syrup, melted coconut butter, lemon juice, and lemon zest until thoroughly combined. Press evenly into the bottom of the pan and bake for 15-20 minutes, or until it’s golden brown on around the edges. Set aside to let cool while you prepare the filling. 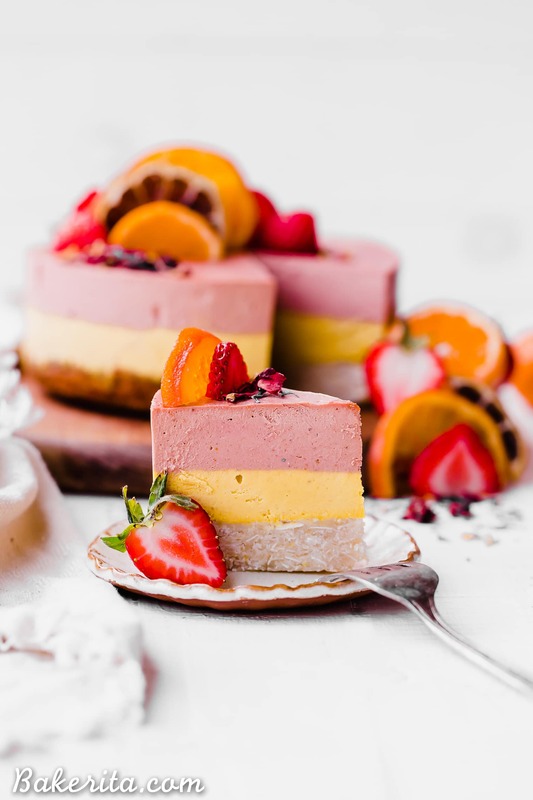 In a food processor or high-powered blender (I used my Vitamix, but most powerful blenders should do the job), combine all of the filling ingredients except for the strawberries and freeze-dried strawberries and blend for about 2 minutes, or until the mixture is silky smooth and creamy. Scrape down the sides as necessary. Pour 2/3 of the filling into the prepared pan over the coconut crust. Smooth out the top and tap the pan hard against the counter a few times to release any air bubbles. Add the fresh strawberries and freeze dried strawberries, if using, to the remaining batter and blend to incorporate. Spread over the orange layer. Place in the freezer to set for at least 3 hours or until completely firm before slicing and serving. Garnish as desired before serving. Serve frozen or let them thaw at room temperature for 10-15 minutes before serving. I recommend running your knife under hot water to warm it up before cutting the cheesecake with the still-hot (dried) knife. Store in the freezer for up to 2 weeks, or in the fridge for up to 5 days.